Jason Manns: New Music, Random Acts with Misha, Advice for New Dad Jensen, and a Free Song in FANGASM! 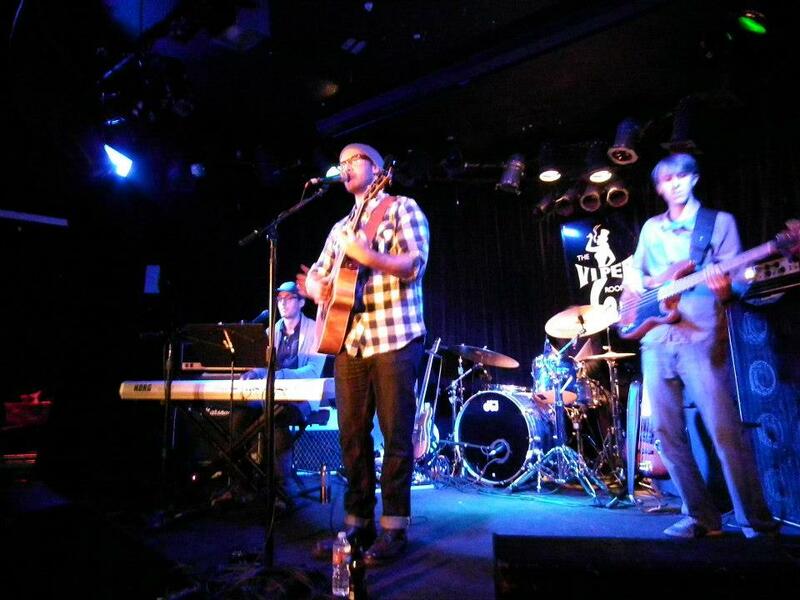 We first discovered Jason Manns’ beautiful music right after we fell in love with Supernatural and dove into the wild and wonderful world of fandom. As we scoured the internet for anything and everything related to SPN, we ran across a YouTube video of Jensen Ackles singing ‘Crazy Love’ at someone’s wedding – with another guy who had a gorgeous voice. 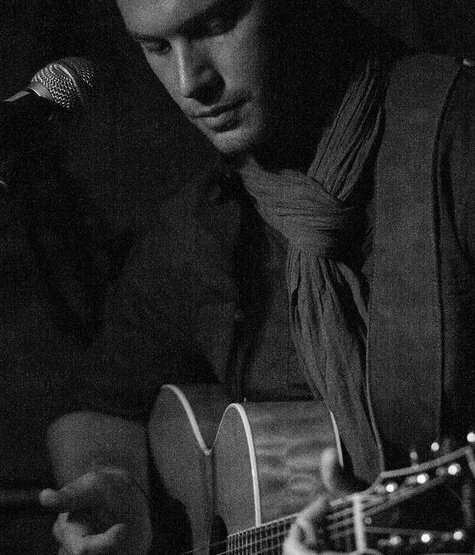 That turned out to be Jason Manns. He and his good friend Jensen have since harmonized onstage and on a special CD single of Crazy Love, and Jason has become part of the SPNFamily. We’ve had the pleasure of seeing him perform and of sitting down to chat with Jason quite a few times over the course of writing Fangasm. During one of those chats, we decided to collaborate, with Jason offering a free download of one of his songs as a bonus for Fangasm readers. You’ll find an exclusive download code in Fangasm, so you can enjoy Jason’s beautiful music while you read. If you haven’t discovered his talent yet, you’re in for a treat! To celebrate the publication of Fangasm this week, we caught up with Jason to ask him a few questions. Us: It’s been six years since you performed at the first Supernatural Asylum convention in England and Jensen joined you onstage to sing ‘Crazy Love’. 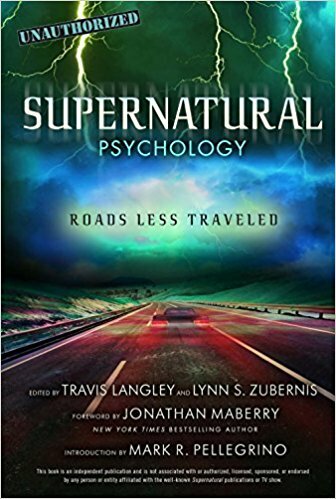 How has the Supernatural fandom influenced your professional journey over the past six years? Jason: Has it been 6 years!? Looking back, I suppose quite a lot has happened since that first show, but it definitely doesn’t seem like it was that long ago. The SPN fans have been so amazingly supportive to me over the years. It’s been fun to watch that fan base grow exponentially from a small online community to this colossal force both online and in the real world. For me the lasting impact of becoming involved with the fandom is I’ve been inspired by their support and generosity to me and (more importantly) some amazing causes. I’d be very curious what the total number of charitable donations given by Supernatural fans over the past 10 years would be between Jensen, Jared, and Misha’s favorite charities, not to mention the rest of the cast! It’s true. Our fandom rocks. And the experience of being able to help others has been powerful for all of us who have been honored to participate in some way. Us: Your music has appeared in quite a few television shows – what’s been your favorite placement and why? Jason: Obviously, it was Supernatural. No other TV show placement has afforded me the opportunities that one has, and none of the other shows have as involved a fanbase. But I’ve had a couple others that were fun. My music was playing at April and Andy’s wedding reception on Parks & Rec, which was a show I’ve enjoyed for a while. It’s always fun to feel like you’re a part of a show you enjoy, even a tiny part. Happy Endings was also a fun one because it was a mid-season replacement show, which no one really gave a chance. Everyone thought it was going to be cancelled. To be honest, I probably wouldn’t have watched it if my music wasn’t on it, but I think they used it on 3 of the episodes in season 1, and when I watched them, I was surprised that the show was really funny. So I was one of the many people who started talking about the show, saying “it’s actually really funny if you give it a chance, check it out!” Having obviously nothing to do with me, it did catch on, and became a bit of a dark horse success. I think it unfortunately got cancelled recently, but it was fun to be part of the group that was really rooting for the show and then see it get some notoriety and actually run for a few seasons. I think they used some of my tunes in season 3 too. Needless to say, I was sad to see it go! Lynn: In fact, that’s how it felt to be a fan of Supernatural in the early seasons. We were a relatively small group of die-hard fans rooting for our little Show to succeed against all odds. When it did, I think we all felt the success as keenly as the people who actually make the Show! 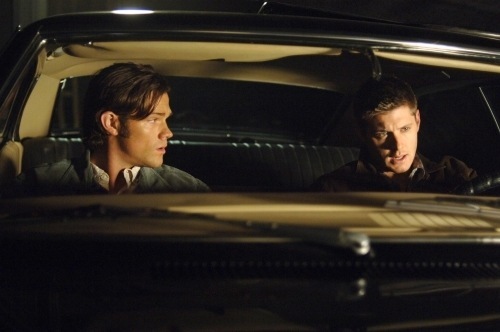 If I recall correctly, though, Dean yanked the iPod playing your song, “Vision”, out of the Impala pretty damn quickly when he returned from hell to find that Sam was listening to Jason Manns. And that’s still your favorite? Jason: That gave Eric a pretty good laugh, then he asked for a CD and grinningly said he’d make sure they “found somewhere to use it.” Keeping that conversation in mind, the scene they used the music in was actually genius. I loved that there were actual layers to the inside joke. The fans knew Jensen and I are buddies, he’s always super supportive of my music, and we perform together occasionally, so for Dean to hate the music was funny in itself, but also knowing the conversation that Kripke and I had, that adds a whole other layer to the joke. Us: Now we have to go back and watch that scene again, and laugh even harder. Nobody does inside jokes better than SPN. There are inside jokes inside of other inside jokes….meta inside jokes, if you will. No wonder we love this Show. Us: So, you’ve performed not just in the US, but all over Europe. Are the audiences you draw different in European venues? Jason: In some ways the audiences are different in Europe. There’s usually more people in them for starters! I think part of that is the convenience of getting to the venues, If I play 5 shows spread out over Germany, chances are almost everyone in Germany that wants to come to the show can get there, whereas in the US, I’d have to play 3 shows in every state, (probably 10 in Texas!) to make it convenient for everyone to get to a show. Beyond that, I’ve noticed that specifically when comparing the European audiences to those in LA or NYC, they are just a bit more attentive. I love my folks back home, don’t get me wrong, but there is a little greater focus on the music overseas, and here, people like to socialize during the set a bit more. Which is ok too, obviously I’m thankful for anyone that buys a ticket, but specifically speaking about those moments spent on stage, it’s nice when people seem to really focus on what you’re playing. Lynn: I must be the exception – I’m not very sociable when I’m listening to someone play whose music I love. (Yes, Lynn does actually stop talking every now and then… Kathy will probably dispute this.) Possibly because I’m too busy singing along. (Kathy will not dispute that.) I can’t listen to your music and do anything else at the same time, I get too caught up. What’s your absolute favorite place to play and why? Jason: The place I haven’t played yet. On this upcoming tour I’m playing in Budapest. I’ve never been to Hungary, and I’ve heard amazing things about Budapest, so I’m really looking forward to it. It’s going to probably be the smallest show on the tour, as I’ve never been there, but just seeing new places, and meeting new people is one of the best aspects of getting to tour. Us: You’ve described your second album, “Soul”, as a bit darker and with more R&B influences. What are your favorite songs from that album, and why? Jason: “Soul” is probably my favorite song on the album. It was probably the most collaborative song I’ve ever written, as there were four writers on it, and it was the first song I’ve ever written with my brother Matt. His influences have always been more R&B than mine, so it was a different rhythm than the songs that start off on my guitar. It’s just fun to play! Us: That makes it even more special that you picked “Soul” as the free download to offer with Fangasm — it happens to be one of our favorites too! How would you describe your latest album, “Move”? What has been the most exciting and the most meaningful song on this album for you? Jason: “Move” is more of a feel good album than the first two. It’s a bit more self-contained, in that all of the writing (almost all) was done around the same time, all of the music was recorded over just a few days, (with absolutely stellar musicians I was lucky to be able to work with!) and the vocals we did at home. I feel like “Move” is a melody driven album with a laid back vibe. I think it’s a good driving album or better yet, a good soundtrack for an afternoon beverage in the back yard. Lynn and Kathy: (are nodding enthusiastically) It is, it’s great driving music. Jason: Most exciting song to me is “Never Let You Leave Me (Again)”. I wrote it with my friend Aaron Beaumont, who is accompanying me on this next trip overseas to play keys for me, and it’s a fun one. It’s basically from the viewpoint of someone who is finally fed up with being the fall back option for their significant other and decides to let them know, and even though it’s a break up song, and lyrically it’s actually pretty biting, it’s all presented in a very upbeat way. It’s definitely different than most of my stuff. It was really fun to branch out, and I’ll definitely be writing more with Aaron. One of the things we love most about Jason’s music is that the songs are often so relatable. Who hasn’t been in a relationship that you know it would be best to get out of, but it takes a while to be fed up enough to actually do it. It seems entirely appropriate to have an upbeat song celebrating that point where someone finally says, enough! Hmmm. Maybe we should have offered that one in Fangasm. There’s a bit of drama in the book too (how could there not be??) in between our fangirl adventures and chats with the SPN actors. Us: Over the past year we’ve enjoyed your online performances on StageIt. What’s it like playing for a virtual audience? Jason: Really weird! (at first) To finish a song played live for hundreds of people, and hear… absolute silence… took some getting used to. It’s much different to have to read your applause. Once I got used to that aspect of it, and remembered not to read the ongoing chat that runs next to the live feed while I was playing because some of the comments made me laugh out loud in the middle of a song, I settled into it. It’s really a groundbreaking concept, and it’s been a perfect way to connect with people who may not be able to make it to a live show. I don’t think it will ever replace the “in person” live show, but it’s been a really fun addition to the routine! Jason: I think SPN fans are incredibly tech savvy and they have a staggering presence on every facet of social media. That has been a huge help for me, and I’m very thankful. I also think I’m really lucky to have started my music career right when it became possible for an independent artist to have the tools necessary to make a living without a record deal. It wasn’t that long ago that if you didn’t have a record company selling your album, the only place someone could buy it was from you personally. Now with the myriad of online distribution channels, music streaming sites, and the availability of marketing on social media sites, my music is in basically all the same places people go to buy the artists on the top of the charts. I just have to figure out how to introduce them to it! Us: We hope Fangasm will help with that, because everyone should be able to discover your music! 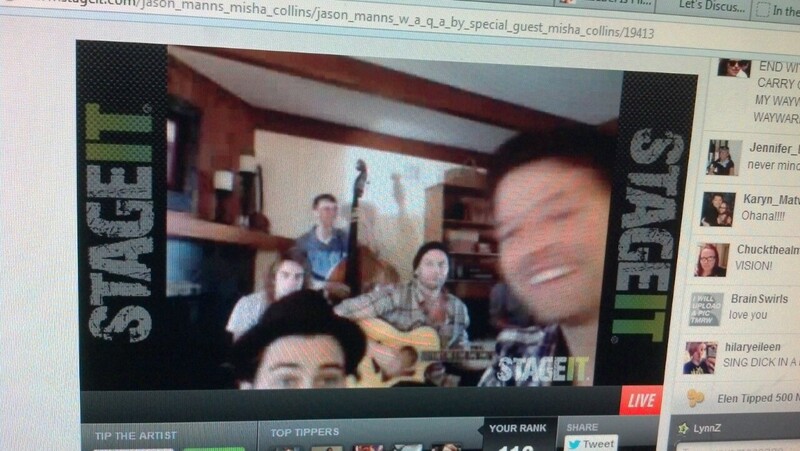 We caught the StageIt show that featured Misha Collins and Matt Cohen helping Jason out. By serving drinks. In aprons. Which we very much approved of. Jason: As I mentioned before, I’m constantly inspired by the generosity of the SPN fandom. Misha and I spoke about doing a fundraiser for the Random Acts charity, and StageIt seemed like a good option as we could be here in LA and connect with fans all over the world. I told Matt about it and he was excited to help out however he could. I know this is shocking, but we didn’t really have a plan for it. Lynn and Kathy: *feign shock* The SPN guys, improvise? No way! Jason: We just figured I’d play some tunes, Misha and Matt could do a little Q&A and that would be that! 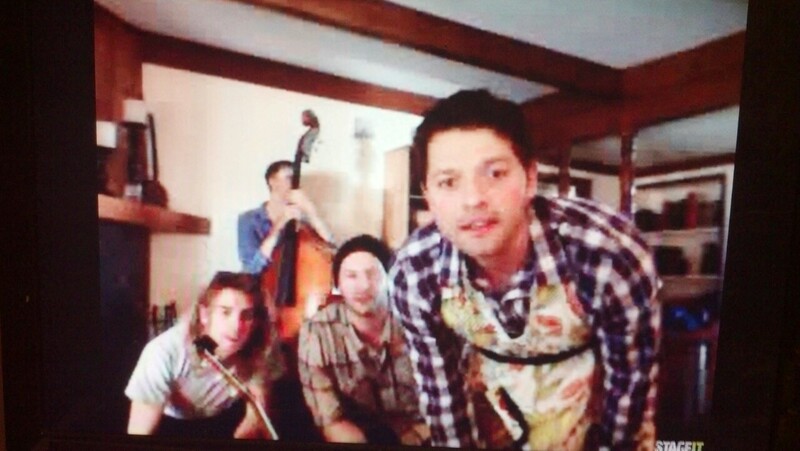 I was already playing by the time Misha and Matt came out with the aprons, so I’m not sure whose idea it was. If I had to guess, I’d put my money on Misha though! Lynn and Kathy: Ya’ think? Us: The SPN Family just happened! Best fandom in the world, bar none. 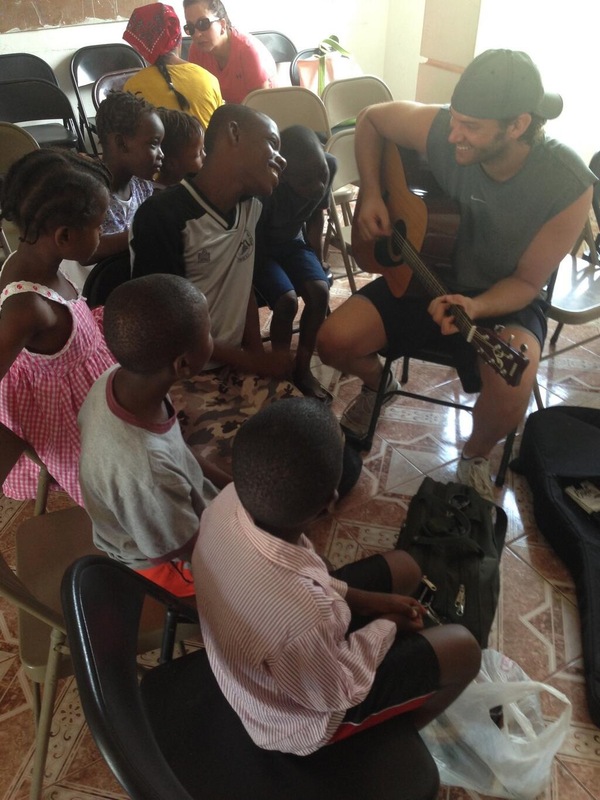 Jason also had the opportunity to go to Haiti with Misha and Random Acts earlier this year. Misha wrote a chapter for our next book, to be published in 2014, (Fan Phenomena: Supernatural) on the impact that Random Acts and the power of Supernatural fandom has had on him personally, which is quite moving. We wondered if Jason felt the same. Us: You’ve said your trip to Haiti was ‘life changing’. 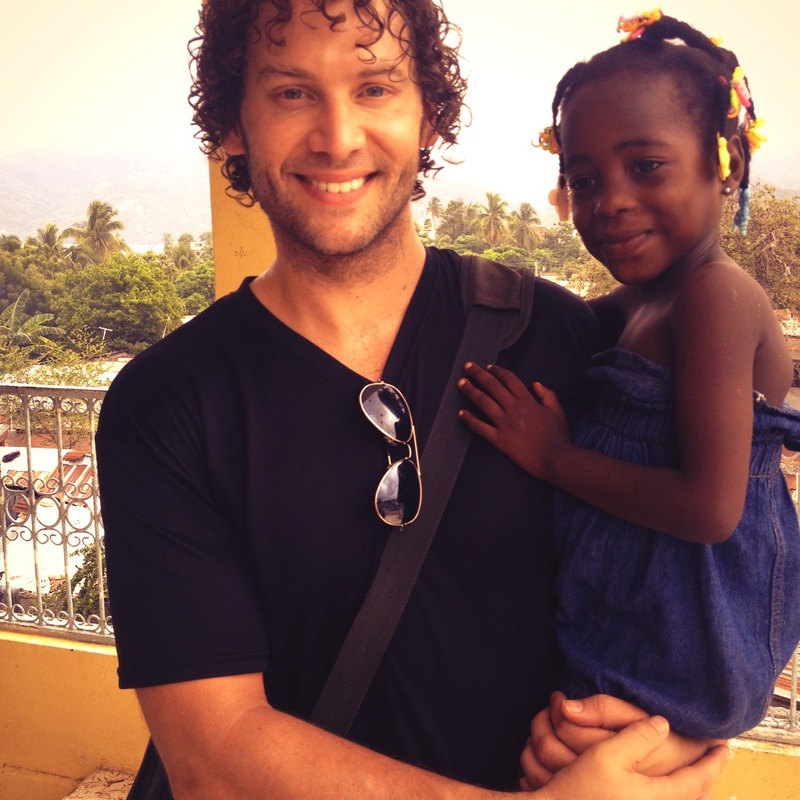 What part of that trip or that mission had the most powerful impact on you personally? Jason: It was life changing in two specific ways. I don’t think it’s possible to meet those children, almost all of whom were either orphaned or rendered homeless by the earthquake, and not be changed. They were so full of joy, so hopeful, without all of the material luxuries even some of the poorest people here have, it was really a wake-up call to be optimistic whenever possible, and helpful in any way I can. The second was seeing the intelligence with which the Random Acts team spent the donations they raised. They didn’t just write a check, and they didn’t just mail some food. They physically went to Haiti, did research, and found the absolute most deserving people and built them a beautiful building. That place will be there for so many of those kids for a long time to come. It really made me rethink my idea of charity. It inspired me to not just write a check, but to get involved and make sure that money is doing the most good it possibly can. Us: The SPN Family has made a difference in the world, no doubt about it. Us: Your fans also rallied to help you win the Artist Signal contest. Congrats! What has been the most surprising thing to you about fans in general, and about Supernatural fans in particular? Jason: Their tenacity. They are dedicated, organized, and persistent. I’m so happy they’re on my side. Us: We are. After all, you’re part of the family. And speaking of family, you and Krista have a young daughter, and now Jensen and Danneel have a daughter as well. What advice did you give Jensen on parenting a daughter? Have Kingston and JJ had any playdates? Jason: And as for their play dates, you’ll have to ask them. JJ just picked up Kingston on her Harley, and they wouldn’t tell me where they were going. They grow up so fast! 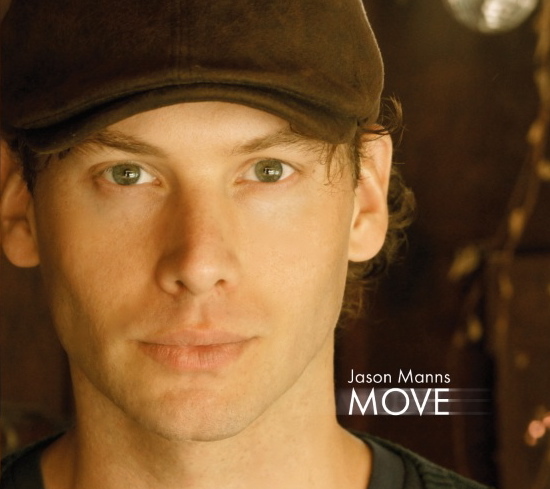 Check out all of Jason’s beautiful music at http://www.jasonmanns.com, or buy on iTunes, CDBaby or amazon! And don’t miss the free download of one of our favorite Jason Manns songs, “Soul”, when you buy our new book, Fangasm! The exclusive download code is in the book, which you can purchase from amazon.com using the link at the top right of this page. Happy reading — and happy listening! ← Celebrate SUPERNATURAL Season 9 With A FANGASM Giveaway! DELIGHTFUL article, ladies! I love Jason’s music, and thank both you and him for giving me “Soul” along with Fangasm. Pity I didn’t include him in my article of fandom charity in your upcoming Fan Phenomena collection … oops! Thanks for another great interview and for the reminder to download Jason’s song. After finishing Fangasm, I forgot to go back and do that. Can’t wait for Fan Phenomena! Can we get more hints regarding the chapter authors? I loved the interview, Jason has the most beautiful voice I have ever heard. I am one of those dedicated fans who voted more than 600 times in Artist Signal in July and keep in mind that you can only vote once an hour, but he deserves it and I hope soon he can sing for Latin America. However, I have a bone to pick – I always buy his Stageit performances, knowing as I do so that I won’t be able to see most of them, because I am at work, and my boss would beat me about the head and neck if I removed my nose from the grindstone. Hey you – just stumbled across your piece of work. Thanks for the nice reading! Nice to hear that our fandom is valued so high and that you took the chance to write about it!